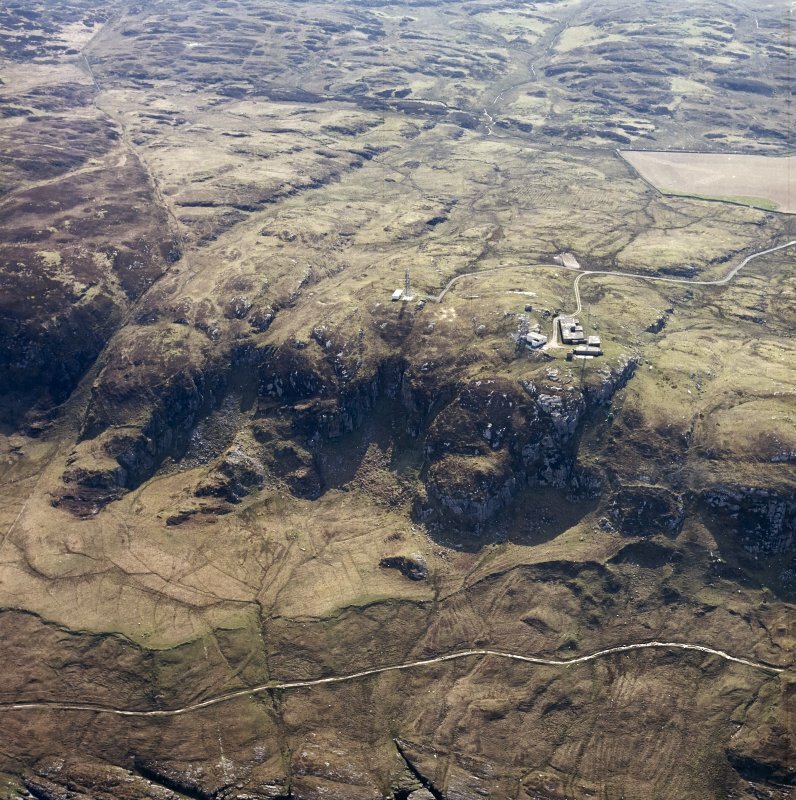 Oblique aerial view centred on the radar station and the remains of the dun, taken from the WNW. 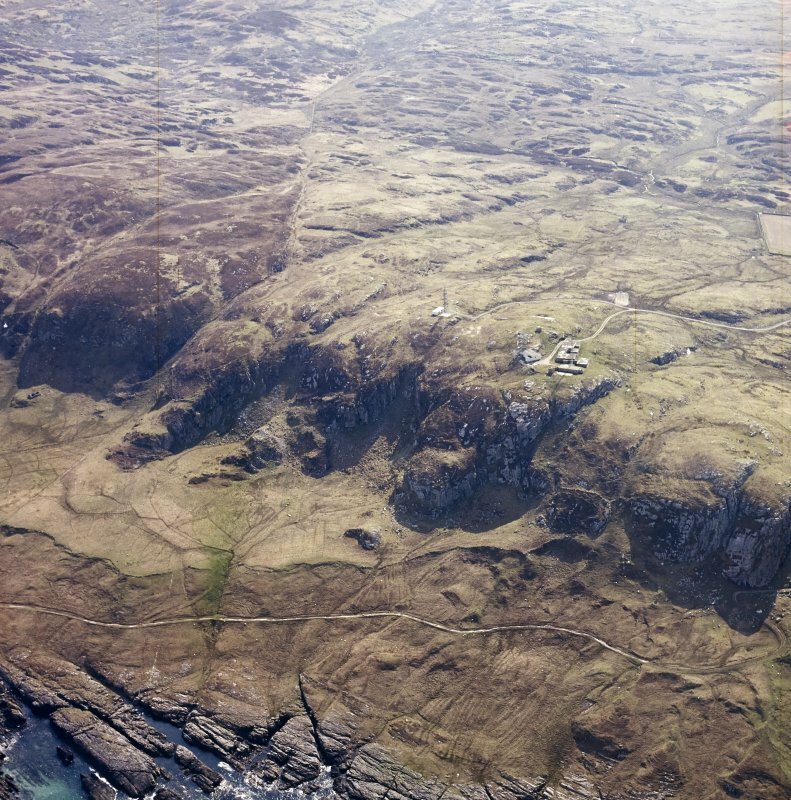 Oblique aerial view centred on the radar station and the remains of the dun, taken from the NW. (West coast). Dun Chroisprig, perched on a spur about half-way down a 200ft [61m] preceipice, and about 50yds [46m] from [a] sandy shore. Most of the stone wall has fallen down the precipice. V G Childe 1935, no. 21. A dun, with outworks, situated on a rocky knoll linked to cliffs by a narrow spine of rock. The wall mainly follows the outline of the summit to enclose a roughly circular area 12m in diameter, and measures 3.5m in average thickness. It is best preerved on the N where it stands 1.1m high. The entrance is on the NNW. There is a discontinuous gallery 1m wide in the thickness of the wall on the N and S. An outer wall can be traced intermittently on the ESE, E, NW and W, before it makes an abrupt change of diretion on the SW,to run towards the dun wall. There may have been a gateway on the NW and there is reconstruction on the ESE and SW. Newall notes 'at least one round house' enclosed by a complex of walls in the gulley below and to the E of the dun. S Piggott and C M Piggott 1948; F Newall 1966; (undated) information in RCAHMS. 20m to level ground below, much of its NE side being a sheer rock face. The easiest approach is from the NNW over a series of narrow terraces. interior. The entrance is on the WNW; it is 1.5m wide, and the walls of the passage are visible to a height of 0.9m above the debris. supported by rough corbelling. The S section of the gallery, which seems to be set at a higher level than the other, can be traced for a length of about 11m. Additional protection was provided by an outer wall, of which traces can be seen intermittently as shown on the plan. 0.9m in height. For some distance beyond this point no trace of walling survives, but intermittent stretches of outer facing-stones reappear on the outer edge of the highest natural terrace below the dun on the NW side. From there, after a gap which may mark the position of an original entrance, a spread of rubble core material, accompanied in places by short stretches of the outer face, up to 1.2m high, continues along the top of the steep scree-covered slopes on the w before making an abrupt change of direction to run towards the dun wall on the SW. Near the SW angle a single course of what may be an internal revetment is exposed to a height of 0.6m for a length of about 1.5m. A little to the NE, and inside the line of the outwork, a short detached length of walling appears to form the E side of an entrance-passage, of which the other side is roughly defined by a band of rubble, which links it with the outwork near its sw angle and near a small rectangular enclosure of recent date. It is difficult to regard this piece of walling as an original feature, and it is almost certainly a reconstruction made, possibly, at the same time as the inner of the two walls already mentioned ESE of the dun. A dun, generally as described. There is a no trace of any round house or 'complex of walls' to the E of the dun. Visited by OS (B S) 8 May 1978.